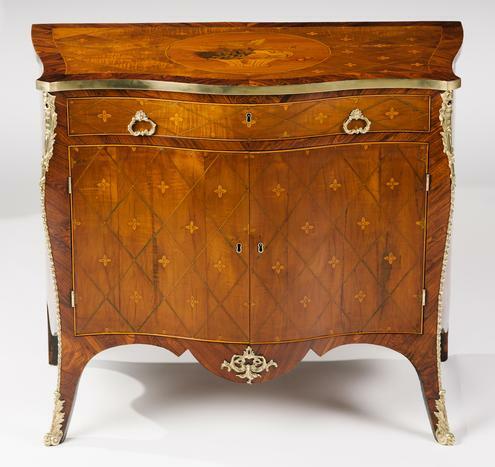 A Fine George III Harewood, Kingwood and Marquetry Secretaire Commode, in the Manner of John Cobb - Hyde Park Antiques, Ltd.
A serpentine crossbanded top with brass band edge is inlaid with trellis work and flowerheads and centered by a circular panel inlaid and painted with a fruit basket; above a conforming case with a drawer fitted with a sliding leather-lined writing surface opening to a fitted interior and hidden locked compartment; over two doors opening to a shelved interior and shaped apron; raised on downswept legs with brass mounts to the keeled corners and feet. 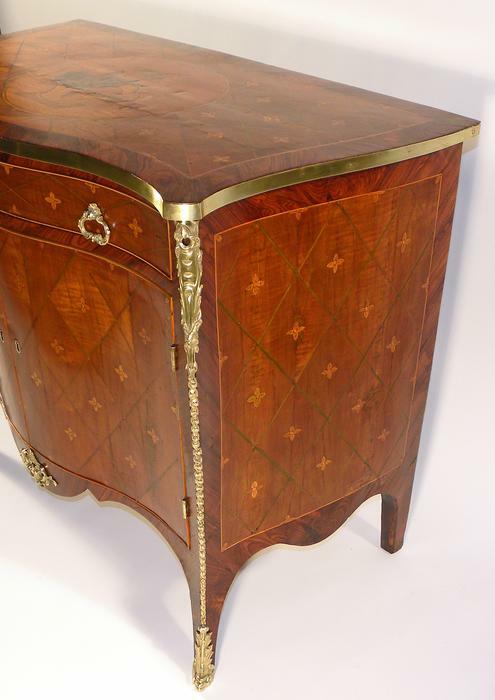 The marquetry and lacquered mounts on this commode place it in a distinct group of English furniture that are clearly inspired by French designs. 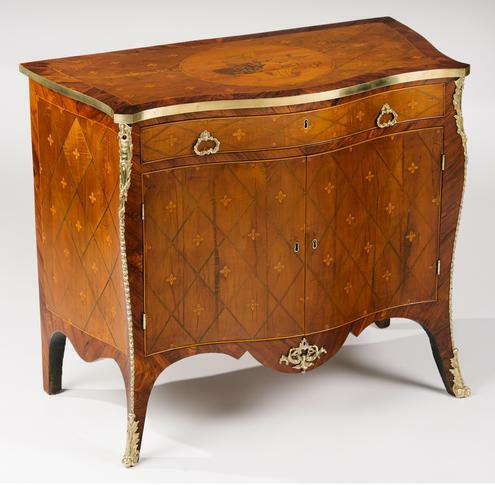 Pierre Langlois (d.1767), a French cabinet-maker who established his London workshop in 1759, was the first to introduce this style. 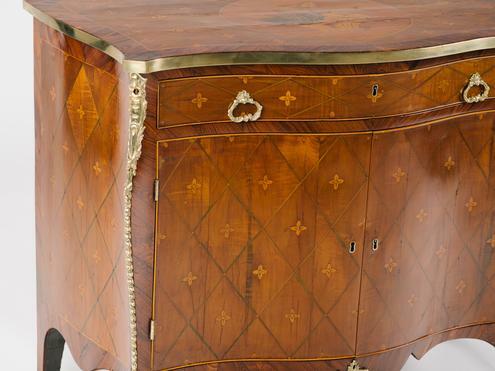 It was soon emulated by his English contemporaries who relied on specialist 'marqueteurs' to supply the more elaborate inlaid panels like the basket of fruit on the top of this commode. 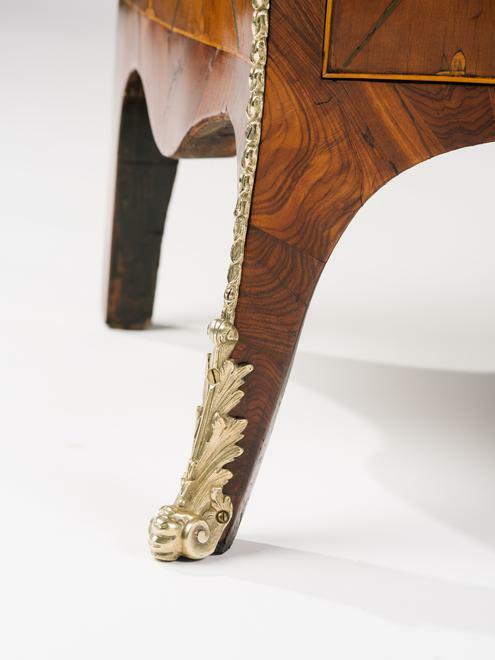 Interestingly, a pair of tables and a commode attributed to John Cobb (d. 1778), one of the principal cabinet-makers known to have worked in this style, have related oval panels of fruit (C. Streeter, Marquetry Tables from Cobb’s Workshop, Furniture History, London, 1974, Vol X, pp. 52-3, plates 28a, 29a). For a similarly shaped commode (also with brass banding to its top) attributed to John Cobb, see L. Wood, The Lady Lever Art Gallery Catalogue of Commodes, London, 1994, p. 88.